The Downtown Services Section is responsible for ensuring public safety at the 3rd Street Promenade and in the downtown Santa Monica area. Downtown Santa Monica is one of the most travelled and visited areas in the world. It is a domestic and international tourist retreat welcoming well over 7.3 million visitors annually. The downtown area is home to over 450 businesses, the world renowned Third Street Promenade and Santa Monica Place. Nine of the thirty-nine hotels in all of Santa Monica are located in the downtown area. Downtown Santa Monica averages a weekday population of 80,000 and can grow to well over 100,000 on weekends. Over the last couple of years, the average weekday and weekend population have reached record numbers. The anticipated arrival of the Expo Light Rail is estimated to bring in additional 30,000-60,000 daily visitors into the vivacious downtown area. The Santa Monica Police Department has two dedicated units, the Downtown Bicycle Unit and the Homeless Liaison Team that are assigned to Downtown Santa Monica and surrounding areas. The Downtown Bicycle Division otherwise known as the Baker Units is comprised of (1) Sergeant and (8) Officers, who provide safety to the Downtown Santa Monica's visitors and merchants. They are a proactive, visible and uniformed presence that patrols by way of bicycle, foot or vehicle. The unit strives to provide excellent customer service by eliminating crime and social disorder. This is done by collaborating with the community via positive interactions, open communication and continual constructive dialogue with the stakeholders of Downtown Santa Monica. The Downtown area is divided into three zones where each zone is patrolled by a Downtown Bicycle Detail. Maintain and make available to all department employees a list of assistance programs and other resources that are available to the homeless. Meet with social services and representatives of other organizations that render assistance to the homeless. 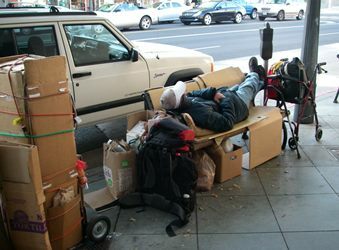 Remain abreast of laws dealing with the removal and/or destruction of the personal property of the homeless. Be present during any clean-up operation conducted by this department involving the removal of personal property of the homeless to ensure that the rights of the homeless are not violated. Develop training to assist officers in understanding current legal and social issues relating to the homeless.